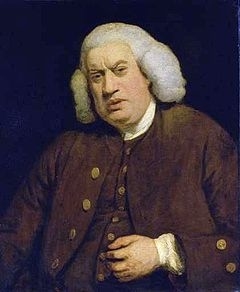 For those who love the English language, Dr Samuel Johnson, who would have been 300 this autumn [written 2009] was the definitive English ‘man of letters’. Immortalised for some by Robbie Coltraine’s clever lampoon in Blackadder III as the author of the first English dictionary, the 18th C writer and critic was the ultimate exponent of all things sesquipedalian. But as the last word as an essayist and lexicographer, scholars now think that England’s foremost wordsmith was one of the earliest sufferers from the then, ironically, undefined condition now known as Tourette’s Syndrome. Known for his peculiar tics, mannerisms and facial expressions, Johnson, a doctor of laws, was educated at Lichfield Grammar School and spent a brief period at Oxford University, but was forced to leave due to lack of money. Unable to find teaching work, he drifted into a writing career, marrying Elizabeth Porter, a widow more than 20 years his senior. In 1737, the same year of the founding of the oldest English language newspaper in the world, Johnson moved to London where he struggled to support himself through journalism, writing on a huge variety of subjects. But it was thanks to his dictionary, written during the reign of George II, that he gained everlasting fame. By the early 1740s, he had gradually acquired a literary reputation and in 1747 a syndicate of printers commissioned him to compile his 'Dictionary of the English Language'. Amidst a general dissatisfaction with the dictionaries of the period, Johnson penned his magnum opus for the sum of 1,500 guineas, the equivalent to about £220,000 today. The exhaustive task took eight years, and Johnson employed six assistants, all of them working in a house off just off Fleet Street. The dictionary was published on 15 April 1755, and while not the first of such, was certainly the most important at that time. Johnson himself pronounced the book "Vasta mole superbus" ("Proud in its great bulk"). Outside a few special editions of the Bible, no book of its size, 18ins by 20ins, had even been set to type. This first edition of the dictionary contained a 42,773 word list, to which only a few more were added in subsequent editions. An important innovation of Johnson's was to illustrate the meanings of his words by literary quotation, drawing on Shakespeare, Dryden and Milton. In Johnson's lifetime five further editions were published, and a sixth came out when he died. Until the completion of the Oxford English Dictionary, 150 years later, Johnson's was viewed as the pre-eminent British dictionary. The rise of literacy among the general public, combined with the technical advances in the mechanics of printing and bookbinding, meant that for the first time, books, texts, maps, pamphlets and newspapers were widely available to the general public at a reasonable cost. Such an explosion of the printed word demanded a set pattern of grammar, definition, and spelling for those words. However, Johnson was continually short of money, despite the success of his dictionary. Thankfully in 1762, his financial situation was alleviated when he was awarded a government pension. Both Johnson and Boswell set out on a three-month tour of the Scottish Highlands and the Hebrides, the pair writing accounts of their travels and Johnson spent a considerable amount of time in Edinburgh in the 1770s. Johnson was by now the leader of the London literary world, and a friend of notable artists and writers such as Joshua Reynolds, Edmund Burke, Oliver Goldsmith and the actor David Garrick. Aside from the dictionary, towards the end of his life, he produced the massive and influential Lives of the Most Eminent English Poets, a collection of biographies and evaluations of 17th- and 18th-century poets. Johnson was a robust figure, but his odd gestures and nervous tics were confusing to some on their first encounter with him. Boswell's Life, along with other biographies, documented Johnson's behaviour and mannerisms in such detail that they have since led some to suspect he suffered from Tourette’s Syndrome, a condition unknown in the 18th century. His later works included essays, an influential annotated edition of William Shakespeare's plays, and the widely read novel Rasselas. After a series of illnesses he died on the evening of 13 December 1784, and was buried at Westminster Abbey. It was only in the years following his death that Johnson began to be recognised as having had a lasting effect on literary criticism, and even as the greatest of critics of English literature. · Johnson's wife had died in 1752 and shortly afterwards Francis Barber, a former slave from Jamaica, joined Johnson's household as a servant. He lived with Johnson for more than 30 years, as did his wife and children, and became Johnson's heir. · The first editions of the Oxford English Dictionary reproduced over 1,700 of Johnson’s original definitions, acknowledging them with the letter J.